Around these parts, things change faster than you can say easy-peasy-lemon-squeezy. In our August newsletter, we recapped launching Version 1, told you about Version 1.1, and before the ink was dry on the newsletter we released Version 1.2. Really, the version designations are somewhat artificial because we are web-based/cloud-based, there is no CD-ROM to install, update to download, or reboot necessary for clients. This approach has a number of benefits for users. With BumbleBee updates are instantaneous (don’t worry, we usually make sure there is a lull before going live with changes). It is as simple as that. The next time you click on a button or log in, you see the changes. No more waiting for a holiday or “clean-up” day when your children are not present. And there is no need to upgrade your computer to meet the latest system requirements. Everything is incremental. The downside of this approach is that sometimes users don’t know we made an improvement or made a fix until we talk reach out. Well, as of now, that is ancient history. 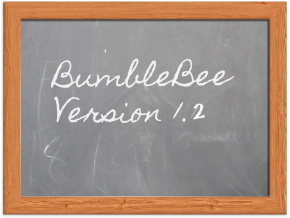 Starting today, we are going to have a rolling changelog to keep you up-to-date on the latest improvements and, erhem, occasional bug fixes to BumbleBee. While we know this will not be something you leap out of bed in the morning to check, we do hope it will be something you look at from time to time (note: we do not recommend leaping out of the bed in the morning). You might find something that you were asking for or did not even know you needed. 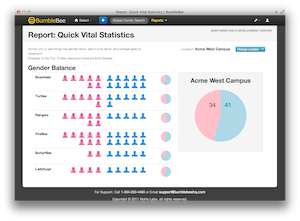 Also, when possible will try to provide a link so that BumbleBee clients can click straight through and log on to see the change (e.g., our new vital stats report). Of course, we can do that, because we are cloud-based. Note: For the few of you out there who are subscribing to our blog by a RSS feedreader (e.g., Google Reader), you may need to remove and re-add feed link with the new blog feed, unless you do not mind seeing our changelog mixed in with blog posts. Whether it’s your dentist, your minister, your doctor, or your tree doctor, they all want to know the same thing: how did you hear about us? You might wonder why they should ask since you are already their client. Quite simply, this is the cheapest and most important marketing feedback mechanism available to any organization, including childcare and early childhood education providers. Asking is the easy part and it is the most important part. It’s a good idea to ask when you get a phone call asking about childcare availability at your center or even a simple inquiry about your tuition. 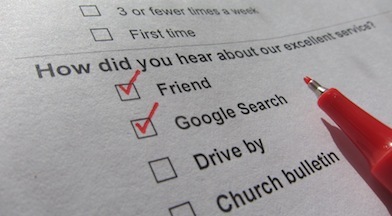 This “referral source” question, should be one any inquiry form on your website or paper application as well. Most families will be more than happy to answer the question since they want you to be able to put them as to the context of their inquiry. It’s only human. We have seen some of the best-run childcare organizations BumbleBee has met using this referral source question as part of their everyday business practice with new clients. It’s also the most common question we see clients add to their online applications in BumbleBee. As we mentioned in our webinar at Early Childhood Investigations, we have seen some childcare directors that have dedicated notepads at everyone’s desk so they remember to ask the referral source question when someone calls (we made a childcare specific notepad here that you can print on your own on the cheap here). 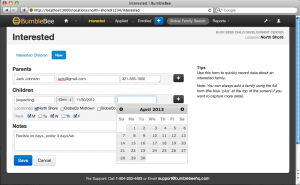 If you did want to take the next step, and make your referral source responses more actionable. Here is what I suggest. Look at how people are hearing about and think about that through the lens of how you spend your marketing budget (dollars and time). Now ask yourself this question: do I want to attract more people like my current client base of families or do I need to tap into new pools of families? If it is the former, increase your marketing resources for what you already know works (e.g., the church bulletin). If it is a new audience you want to reach, it might be time to try a Google Adwords campaign for a few months before your enrollment season or perhaps trying a print ad in the local parenting magazine. If you learn that there is a specific family that is referring gobs of other families to your center, go ahead and honor that family by thanking them personally. They will probably be glad to hear they are a trusted reference. In our recent parent survey, we asked a similar question of parents: how did you research different childcare options. You can see from the chart that for this small group of respondents, overwhelming favors personal referrals. However, note the large percentage of folks that are using Google searches as one of their primary research tools. That would be key information if I were recruiting this population of parents to my nursery school. So go ahead and make “how did you hear about our childcare center?” a part of your everyday practice. The answers might surprise you and, who knows, you might even meet your new best friend because of the spark in conversation. Do you ask your clients how they heard about you? Have you learned anything from doing so? By Ben on 2012/08/07 / Blog / Comments Off on 3…2…1… Launch! We at BumbleBee are really excited! We officially launched, from the “beta” version of our software, to “Version 1.0”. The beta phase has allowed us to get an initial version of the product in the hands of a few customers, let them use it to support their business, and then use their feedback to improve the version for a wider launch. Reworked Top-Level Navigation: Change starts at the top… of the screen. Customers can do more to quickly navigate from any page to: switch locations (if they have more than one), easily get to child information, perform global search, add new families, find reports and more. 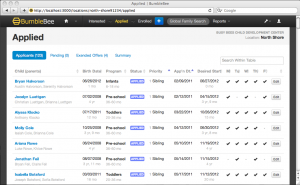 Interested -> Applied -> Enrolled: BumbleBee is now completely organized around managing each stage of a family. Specialized screens support activities related to managing interested families (those that have called, emailed, inquired, taken a tour, etc. ), applied families (those that have decided to formally apply for a spot), and enrolled children (those that are currently attending). Within that there are tools to manage offers, and other related sub-steps. Action-oriented Dashboards: Each location now has a re-worked dashboard that is designed to support actions, like filling openings, managing offers, approving applications, or recording interest. Sort, Search and Filter, Oh My! : Information is more interactive than before. When looking at a waitlist or classroom, you now have options to sort by any column, search for specific text, or intelligently filter your information. Managing Days, not Just Children: Nearly every screen, from the dashboards to the classroom listings, now bring days of the week to the foreground. Do you need to quickly find someone interested in only Friday care? No problem! Streamlined Interest Form: We’ve added a super-quick, minimal form to let you capture contact information, so that BumbleBee can act as your center’s “parent rolodex.” (Do they still make those?) Want to jot down a name, phone number and a couple of quick notes when someone calls in? We’ve got it covered. 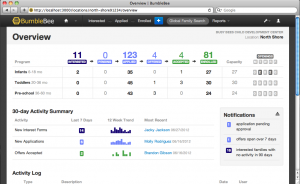 Reports, Reports, Reports: We will be giving you more reports, and more ways to customize and tailor those. Classroom Builders: Many customers use spreadsheets or whiteboards to visualize transitions and new additions to and from classrooms. We want to replicate that experience with an intuitive interface to juggle all those decisions. Projected Openings: We’ll be adding places to put planned transition or exit dates, so that we can see “into the crystal ball” and give you a timeline for when openings will become available in each classroom. Marketing/Interest Management: With the basic ability to enter and track interested families, we will build on that to support outreach to those families in order to build demand. 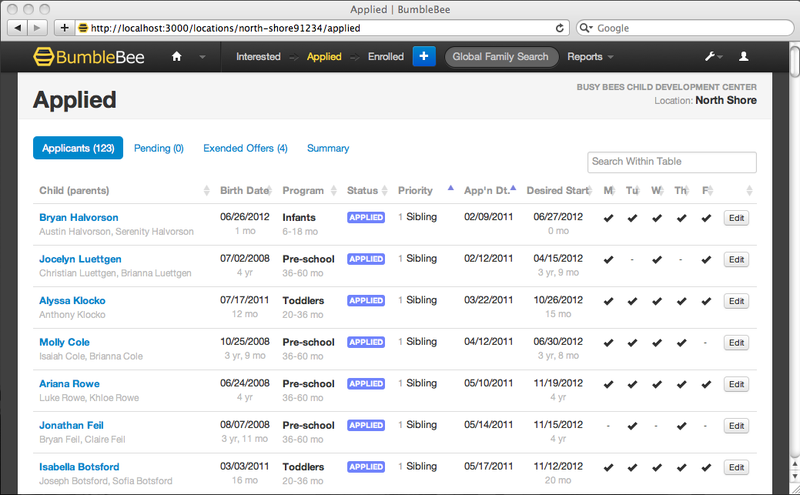 More Form Customization: BumbleBee already has some flexible custom fields, but we’re going to do more, allowing more types of customization, and also provide the ability to see which fields are visible to parents, and which are not. Re-enrollment Support: Some of our customers spend a great deal of time and energy on “re-enrollment” – collecting data from parents on which children will be sticking around for the next school year. … and more! We have some other things in the queue, but we also want to hear from you. What would make your life easier?